An ever-increasing dependence on green energy has brought on a renewed interest in polymer electrolyte membrane (PEM) electrolysis as a viable solution for hydrogen production. While alkaline water electrolyzers have been used in the production of hydrogen for many years, there are certain advantages associated with PEM electrolysis and its relevance to renewable energy sources. PEM Electrolysis for Hydrogen Production: Principles and Applications discusses the advantages of PEM electrolyzers over alkaline electrolyzers, presents the recent advances of hydrogen PEM fuel cells accelerating the large-scale commercialization of PEM electrolysis, and considers the challenges that must be addressed before PEM electrolysis can become a commercially feasible option. Written by international scientists in PEM electrolysis and fuel cell research areas, this book addresses the demand for energy storage technologies that store intermittent renewable energy and offers the most complete and up-to-date information on PEM electrolysis technology and research. 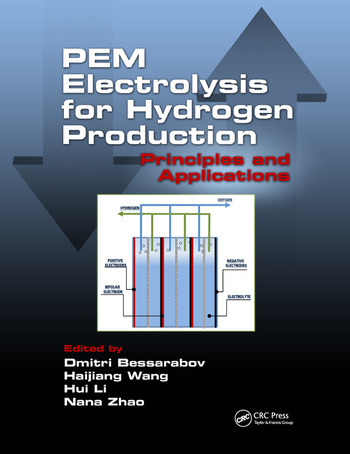 PEM Electrolysis for Hydrogen Production: Principles and Applications provides a fundamental understanding of the requirements and functionalities of certain components and attributes of the PEM electrolysis technology that are common for both PEM fuel cells’ and electrolyzers’ hydrogen applications for energy storage. Beneficial to students and professionals, the text serves as a handbook for identifying PEM electrolysis failure modes and diagnosing electrolyzer performance to improve efficiency and durability. Dr. Dmitri Bessarabov joined the Department of Science and Technology Hydrogen South Africa (HySA) Infrastructure Center of Competence at North-West University and the Council for Scientific and Industrial Research in 2010. His research covers hydrogen and electro-catalytic membrane systems for energy applications and fuel cells. In 1991, Dr. Bessarabov received his M.Sc in chemistry at Lomonosov Moscow State University in Russia before continuing his studies at the Topchiev Institute of Petrochemical Synthesis of the Russian Academy of Sciences. In 1993, he joined the Ph.D program at the Institute for Polymer Science, University of Stellenbosch in South Africa, where he received his Ph.D in 1996. Dr. Haijiang Wang is a principle research officer and project manager in the National Research Council of Canada. He received his Ph.D in electrochemistry from the University of Copenhagen, Denmark, in 1993. He then joined Dr. Vernon Parker’s research group at Utah State University as a postdoctoral researcher to study electrochemically generated anion and cation radicals. Dr. Wang is adjunct professor at five universities, including the University of British Columbia and the University of Waterloo. He has published more than 160 journal papers, three books, ten book chapters, numerous reports, conference papers, and presentations, and has been issued five patents. Dr. Hui Li is a research officer and a program technical lead under the energy storage program at the National Research Council of Canada (NRC). She received her BS and M.Sc in chemical engineering from Tsinghu University in 1987 and 1990, respectively. In 2006, she obtained her Ph.D in electrochemical engineering at the University of British Columbia, Canada. Since joining NRC in 2007, Dr. Li has been working on polymer electrolyte membrane (PEM) fuel cell contamination and durability, PEM electrolysis, and zinc-air batteries. She has co-authored more than 45 research papers published in refereed journals and co-edited three books related to PEM fuel cells. Dr. Nana Zhao is a research scientist at Vancouver International CleanTech Research Institute Inc. She received her BS on polymer chemistry and physics at Beijing Normal University in 2000. After that, she started her Ph.D program on polymer chemistry and physics at the Changchun Institute of Applied Chemistry, Chinese Academic Sciences, in 2002. After obtaining her Ph.D in 2008, she joined Professor Ting Xu’s group as postdoctoral fellow in material science and engineering at the University of California, Berkeley. At the same time, she also worked with Professor Frantisek Svec’s team in molecular foundry at Lawrence Berkeley National Laboratory. "This is a very useful reference book for a variety of people involved in research and application of PEM electrolysers." "This is the most complete and up-to-date review of PEM Electrolysis. It provides an excellent summary of the advantages of hydrogen as an energy storage and carrier medium as we move to a greater reliance on renewable and intermittent power sources. It not only touts the many advantages of PEM electrolyzers for large-scale energy storage, but it also presents the many technical and economic challenges in bringing these systems to market."